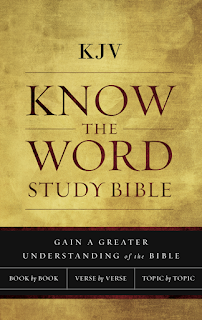 Diving deeper into God's Word can be easy and rewarding if you break it down book by book, verse by verse, or topic by topic with the new KJV Know The Word Study Bible by Thomas Nelson. The book-by-book series of notes leads you through the main points of each book of the Bible. The verse-by-verse notes help you to dig deeper into God’s Word. The topic-by-topic articles, which cover 21 theological topics, guide you through a series of insightful notes and give you a thorough biblical understanding of each topic. With the beautiful and timeless text of the KJV translation, the KJV Know the Word Study Bible offers you choices of how to study Scripture and grow in your relationship with Christ. I was a Bible quizzer in high school. I even won a very small scholarship to a Christian college because I was top in my district. 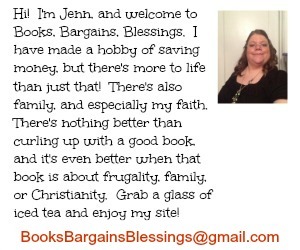 I have always loved Bibles of every type. I have antique ones, journaling ones, and everything in between. When I was offered the chance to receive a free Know The Word Study Bible in exchange for an honest review, of course I wanted to take a look at it and review it. This Bible is not for someone who has a lot of Biblical knowledge already. I think between the title of it and the words "Gain a Greater Understanding of the Bible" that is a given. I read through a couple books I had memorized in high school, and I thought the comments were great. One of the problems I found with this Bible, however, is I couldn't find who authored these things. I have a couple concerns about this. One, if you handed this to a new Christian who didn't have a church background, might they think the topic by topic articles were part of Scripture? Secondly, without knowing who wrote these sections and notes, we don't know their church background. Denominations can have very different sets of beliefs. I know there were passages explained in the notes that I didn't agree with. I liken it to the idea of you can't please all the people all the time. Still, I think at least knowing the church background of whoever wrote the notes would be helpful. There are several different "camps" in Protestant Christianity, and I wonder if when these are handed to new Christians (as I expect will be their main purpose.) if the people will have really looked through it thoroughly. While I don't think it really does any of these Bible study methods justice, I do think it accomplishes its purpose -- helping to TEACH HOW to study the Bible. I don't see this as a Bible that anyone who has been a Christian for a long time would want, but it's an excellent resource for someone who either is a new Christian, or has never grown in their faith since becoming a Christian. I also am not sure a concordance is needed in Bibles anymore, especially since it is available on Kindle. I expect most people would look up verses electronically these days. I would have rather have seen those pages (nearly 80 pages) used on things that I feel would be more useful to new Christians such as Bible reading plans -- I first read through the entire Bible because of a reading plan in the back of a Bible I owned -- also more information on the culture, times, history of the Bible, a more extended map section (there are only seven maps). For all the problems I point out, I definitely have to say this is certainly a Bible to consider giving to someone who is wanting to learn more about the Bible but isn't sure where to start. I would have loved this when I was young teen and was basically using the method of opening the Bible randomly and reading something and that would be my Bible "study". It's a great Bible for what it is intended to be, and I think that's all we can really ask of any study Bible.